ONE way or another, Andy Carroll is on his way out of Anfield. From a Liverpool point of view nobody is going to be able to turn that departure into a positive story. Short of an unexpected and extremely unlikely bidding war Liverpool are going to lose a substantial amount of money on the player – and that’s if they sell him. It may well turn out that the player goes out on loan and if that’s the case the Reds will almost certainly find themselves subsidising his reported £80,000 per week wages. Rumours of Carroll going to Italy had been circulating ahead of last week’s press conference held to discuss the Reds’ upcoming tour of North America. Manager Brendan Rodgers was asked about Carroll’s future and if anything his answers suggested there and then that Carroll wasn’t going to be Liverpool’s number nine much longer. What were his thoughts on stories linking Carroll with a loan move to AC Milan? “He’s a good player Andy,” said Rodgers, pausing before adding, “So he’ll always be linked whether he’s here or not.” Standard practice in answering those types of question is to say how outstanding the player is and how it’s no surprise to hear he’s been linked with other clubs but that’s usually followed with a firm ‘hands off’ message stressing the importance of that player – even if the club do want to get rid. But Rodgers didn’t answer in the standard way. Asked directly if Carroll was part of his plans for the new season he stopped well short of saying he was: “I think initially it’s about assessing the group and the squad and the strengths, you never know entirely until you come in and obviously the pre-season this season is a little broken because of players away with the Championships and recovering, but certainly come the beginning of the season I hope to have the squad to take through, because obviously after August that’s you then, through until January. With no ‘hands off’ forthcoming and Rodgers seemingly reluctant to issue one the story became one of the main ones of the week and will probably stay that way until the player’s future is resolved. But why single Carroll out? 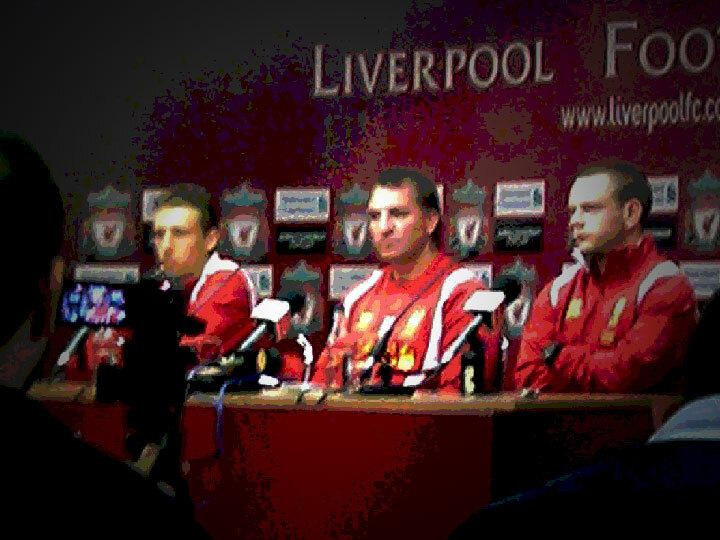 Rodgers has made it clear a number of times that that two attributes are required by him from the players in his squad. They have to be right technically and they have to be right mentally. If the most skilful passer of the ball in recent history was offered to Rodgers he’d need to meet him first to make sure he had the attitude the manager feels is needed for players at a club like Liverpool. This is encouraging for the younger players – he’s told them if they’re good enough they’re old enough – but he’s made it clear that being good enough doesn’t just apply to their abilities with the ball. Some of the current crop of up and coming youngsters will turn out not to meet Rodgers’ requirements technically and might not get as far as an opportunity to show Rodgers they meet his requirements on attitude. But for older players, on the whole, their technical abilities seem to have been accepted by Rodgers and so they are now getting their chance to show him what they are all about. Although Rodgers doesn’t have a great deal of input into the day-to-day running of the official website it’s perhaps telling that Joe Cole has been selected as one of two players to do a video diary of the US tour. The other, Jonjo Shelvey, signed a new long-term contract last week. Maybe Cole, who Rodgers has worked with in the past, is going to get a genuine shot at proving himself on this tour, something that seemed unlikely up until very recently. Cole’s biggest problem may prove to be fitness, but if he overcomes those problems it will demonstrate the kind of determination Rodgers wants from his squad. For many the biggest obstacle to Aquilani’s Liverpool career is that the Reds don’t play in the Italian league. The issue isn’t just about the different styles of football – if that’s an issue at all – but more about whether or not the player can settle in the UK. Having arrived in England with an injury he went on to miss more matches through reportedly minor setbacks, stomach bugs for example, and there were question marks about his mindset. Exactly the kind of questions Brendan Rodgers is going to ask. And that is fair enough. He’s inherited a squad of players with mixed technical abilities and of course mixed mindsets. He can find out about a player’s technical abilities from scouts, DVDs and his own knowledge of the players either at close quarters or as picked up from the sidelines or stands during one of his previous coaching roles. Getting them in for training will help him confirm his initial assessment and to find out which players are capable of fitting into his plans and which ones won’t ever fit into them. He also needs to know which players are worth sacrificing if there’s a chance of upping his transfer budget at the same time. In terms of mindset he’s going to be his own judge of that, it would be a surprise to find him relying on hearsay from others about how mentally ready for battle those players are. So Aquilani gets a chance, Joe Cole gets a chance, the youngsters stepping up from the Academy get a chance. But, it seems, Andy Carroll doesn’t get a chance. But Carroll, it seems, hasn’t passed the first test for Rodgers, the one where his technical abilities fit what Rodgers wants from his player. Carroll is in the squad of 34 but clearly won’t quite feel a part of that squad when he joins up with it after his holiday in Brazil. Rodgers has spoken to Carroll on his holidays, as he said, “So he knows exactly where he stands,” but has it done Liverpool any good to make it so public that the player is so unwanted? One of the sides linked with a loan move was Sam Allardyce’s West Ham, arguably the worst side he could move to in the top flight if he’s going to get experience that’s of use to him in his Liverpool career. Although Rodgers did, eventually, play down the idea that he’d already made his mind up on Carroll it seemed to be little more than trying to, belatedly, say the right thing: “He’s no different to any player we have here, they might have all the attributes but not the mentality to play, it’s a wee bit unfair for Andy to get labelled any other way. Carroll was bought at a price far higher than should have been paid for him – that’s not his fault – but the handling of the attempts to, seemingly, offload him might see him sold for a price far lower than might have been got for him. None of this is helped by the club continuing to talk of a ‘transfer committee’ that will essentially be the club’s director of football without actually announcing the names on that committee let alone the start dates. Unless the names are out of this world perhaps the club should look at finding someone who can start sooner. Wherever that is, it seems unlikely to be Liverpool. And if that turns out to be true, it’ll show just how bold Brendan Rodgers is prepared to be to see his plans for the Reds to come to fruition. LFC 34-man squad for tour of Canada and the US: Steven Gerrard (Midfielder), Jamie Carragher (Defender), Lucas Leiva (Midfielder), Andy Carroll (Striker), Glen Johnson (Defender), Daniel Agger (Defender), Jose Enrique (Defender), Jordan Henderson (Midfielder), Stewart Downing (Midfielder), Charlie Adam (Midfielder), Brad Jones (Goalkeeper), Jay Spearing (Midfielder), Danny Wilson (Defender), Martin Kelly (Defender), Martin Skrtel (Defender), Jon Flanagan (Defender), Joe Cole (Midfielder), Raheem Sterling (Midfielder), Fabio Borini (Striker), Jonjo Shelvey (Midfielder), Jack Robinson (Defender), Alberto Aquilani (Midfielder), Daniel Pacheco (Striker), Peter Gulacsi (Goalkeeper), Andre Wisdom (Defender), Nathan Eccleston (Striker), Krisztian Adorjan (Striker), Suso (Striker), Adam Morgan (Striker), Stephen Sama (Defender), Brad Smith (Defender), Ryan McLaughlin (Defender), Jordon Ibe (Striker), Danny Ward (Goalkeeper). We probably don’t want them putting money in for transfers anyway, whatever their financial situation. Financial Fair Play means we’ve got to at least try and be self-sufficient. As it stands, as far as we know, they’ve not taken any money out of the club yet. We can’t afford to sell Carroll, and I don’t mean that in a purely financial sense. We at present have one striker: Carroll and two forwards Suarez and Borini and that’s it. There are no reserves capable of a first team spot one injury and we’d have a problem, two and we’d be struggling like last season. Add that to the fact that FSG don’t have any cash to buy more players. A conundrum don’t you think? Like him or loath him Carroll has to stay. Bill – If we’ve got another striker lined up (not saying we have) it makes more sense doesn’t it? I’ll try and have a look later – but was that before BR arrived? Dont u think so, Aquaman can be a great player under the tiki-taka style of football? How can the Echo & the Liverpool Post run headlines like “Luis Suarez reopens race row” in todays papers. Can local supporters over there not put manners on the likes of them. There is way to much analyzing going on by the media by wot Rodgers said. What he said about Carrol applies to everyone. He will assess every player too see if they fit into his philosophy/style of play. If Carrol does not fit then so be it. That is not Rodgers fault. If it is true andy is going to leave, it would be sad. no one can deny that his presence inside the box scares the hell out of the defenders. he can give us a different aspect of our attack and it is a pity that he is not given a chance under BR.